Dan Schuchart is an interdisciplinary artist and teacher. In 2013 he earned his MFA in Experimental Choreography from the University of California, Riverside, where he was honored to be a recipient of the 2012-13 Dissertation Year Program Fellowship. Schuchart earned BFA degrees from the University of Wisconsin, Milwaukee's Peck School of the Arts in both Dance and Painting/Drawing and has since worked professionally in both fields. In addition, he recently completed his Graduate Laban Certificate in Movement Analysis from Columbia College Chicago. Since 2002, Schuchart has worked with Wild Space Dance Company as a company member, choreographer, and Artistic Associate. He has actively pursued creating and producing work in collaboration with Monica Rodero, including several independent dance concerts, and curating interactive multimedia gallery events. 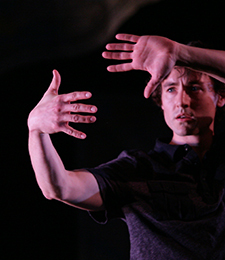 His interests in dance include collaborative creative process, dance-theatre, improvisation, and contact improvisation. Outside of dance, Schuchart has worked as a scenic painter, including the movie Public Enemies, and scenic charge for Milwaukee Chamber Theatre, Florentine Opera, and Skylight Music Theatre.